Soaked Gluten Free Chocolate Cake. Please pardon the baking tray in the background, we frosted the cake during the party so the meatball trays were still out. When the wee one told me he wanted to have a train party for his birthday I got a crazy idea about making a 3-D train cake. So, I took to the interwebs to see if this was something I could do on my own and of course Pinterest was the place I found the answer. I found these instructions there and decided I’d give it a whirl. When it came time to bake a test cake I realized my original plan to bake in a coffee can was foiled because the coffee can we had on hand was not actually metal, but cardboard. So I tried using a quart mason jar. That worked just fine, so I’ll include the directions with the recipe. For the actual cake recipe I knew I’d need to make adjustments, but I’ve never done a sculpted (if you can call this sculpted) cake before so I wasn’t sure what kind of adjustments to make to the batter. I’d read to reduce the oil, but that was for regular cake batter, not gluten-free. Gluten-free cake is a whole other beast. So I talked with my sister-in-law and she suggested adding eggs. I combined the two adjustments for the practice cake and hoped for the best. What I ended up with was a chocolate cake that was slightly more dense than usual making it very similar to a cake brownie. This cake was like a compromise between chocolate cake-dom and brownie-hood. 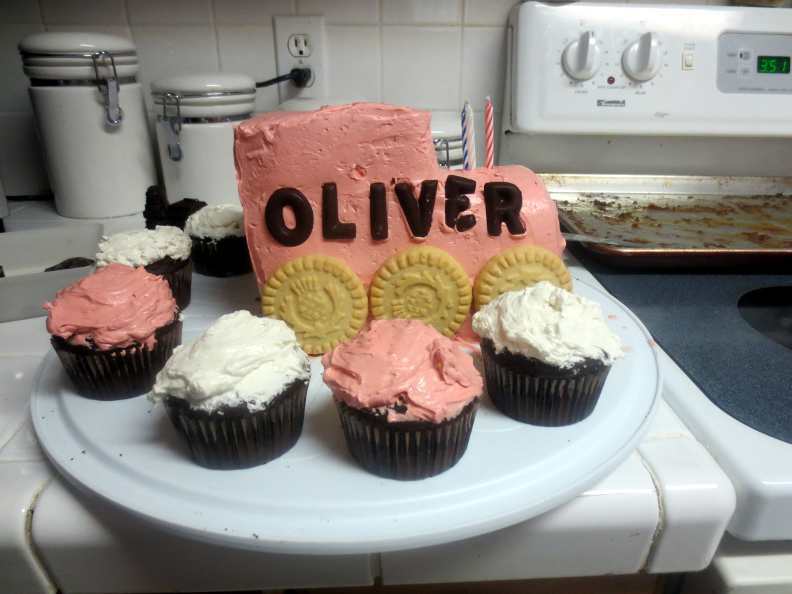 It held together very well and it tasted great, so I ditched my back-up plan of buying a train shaped cake pan and decided to make the 3-D train for the party. To bake a cake in a mason jar you’ll need to thoroughly oil the inside of the jar and cut out some parchment paper to line the bottom. Then oil the parchment for good measure. I filled the jar to the 1 cup line and set it in a water bath (a loaf pan works really well for this) and baked at the normal temperature. The water bath makes it take a bit longer, so start checking on the jar cake 5 minutes past the normal baking time. To remove the cake from the jar, slice a little piece off of the bottom, taking it out with the knife. Shake the rest of the cake out. Combine the flour, cocoa powder, milk and whey/acid in a glass bowl. Mix well, cover and let sit on the counter overnight. In the morning, melt the chocolate in the oil and set aside to cool. In a separate bowl, mix baking powder, baking soda, xanthan gum and salt together. Adjust the oven rack to lower-middle position and preheat to 350°F. Oil two loaf pans (and a mason jar) and line the bottoms with parchment, oiling the top of the parchment as well. In a large bowl, whisk eggs and vanilla. Whisk in sucanat until well combined (it won’t be smooth). Whisk in cooled chocolate mixture until combined. Mix in the dry ingredients then add the flour/cocoa/milk mixture and whisk until the batter is smooth. Divide batter evenly between the loaf pans, leaving enough to fill the mason jar to the 1 cup (or higher) line. Put the mason jar in a water bath. Bake until a toothpick comes out clean, 30-32 minutes, rotating pans halfway. Check the mason jar and add extra time as needed (about 10 minutes). Let cakes cool in pans on a wire rack for 10 minutes. Run a knife along the edges and remove the cakes from the pans, allowing them to cool completely on the rack before frosting or storing in an airtight container on the counter (DO NOT refrigerate). Frost the cake before serving. You can make this cake dairy-free by using water kefir instead of milk. Or water with lemon/vinegar instead of whey. The acid you use doesn’t particularly matter because the chocolate masks the acidic flavor really well. No one will ever know. The cupcakes in the picture are made with water kefir, and they turned out awesomely! ← Party Prep When Preggo. My name is Jennifer Fitch. I'm married to an awesome nerd and we have 2 children. I've recently discovered my love of food. I want to talk about it all the time! Realistically, not very many people share this interest in food conversation so I created a blog as an outlet to share the things I learn about nutrition and my favorite recipes. Bianca Stives on Lilla Rose Giveaway! Jenna on GF Flour Tortillas. hopeforeoe on GF Flour Tortillas. Join < Too Much Fish >!